By Kenyan standards Amboseli is a relatively small Park (392 sq. km) yet its wealth of flora and fauna resulted in the recent designation as an International Bio-sphere Reserve. Amboseli, meaning "Salty Dust" in the Maasai language is an important rangeland for the Masai culture whilst the 'salty dust' itself is volcanic ash from the eruptions of the Mount Kilimanjaro a millennium ago. Amboseli lies immediately North West of Mt. Kilimanjaro, on the border with Tanzania. 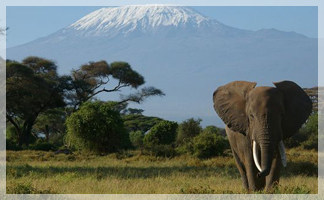 Amboseli was established as a reserve in 1968 and gazetted as a National Park in 1974. The Park covers 392 km2, and forms part of the much larger 3,000 Km2 Amboseli ecosystem. Amboseli is one of the homes of the fabled Maasai peoples. Often strikingly tall and slender, swathed in brilliant red cloth "Shukas", hung about with beads and metal jewellery, the young men (Moran) favour long, plaited, ochre-daubed hairstyles and have a formidable reputation for glamour, prowess and ferocity. Traditionally the Maasai live off the milk and blood of their beloved cattle and believe that all the world's cattle are theirs by God-given right. Their nomadic and pastoral lifestyle, though historically based on the pursuit of the migratory wildlife, is slowly changing thanks to a combination of education, Maasai MPs, votes, favourable new laws, projects, jobs and cash. Climate The coast is always hot with an average daytime temperature of 27-31 degrees centigrade whilst the average daytime temperature in Nairobi is 21-26 degrees centigrade. Temperatures elsewhere depend on altitude. July to August marks the Kenyan winter. Broadly speaking, January-February is dry. March-May is wet. June-September is dry. October-December is wet.